With the arrival of fall, night creeps in a little earlier to push out the daylight. 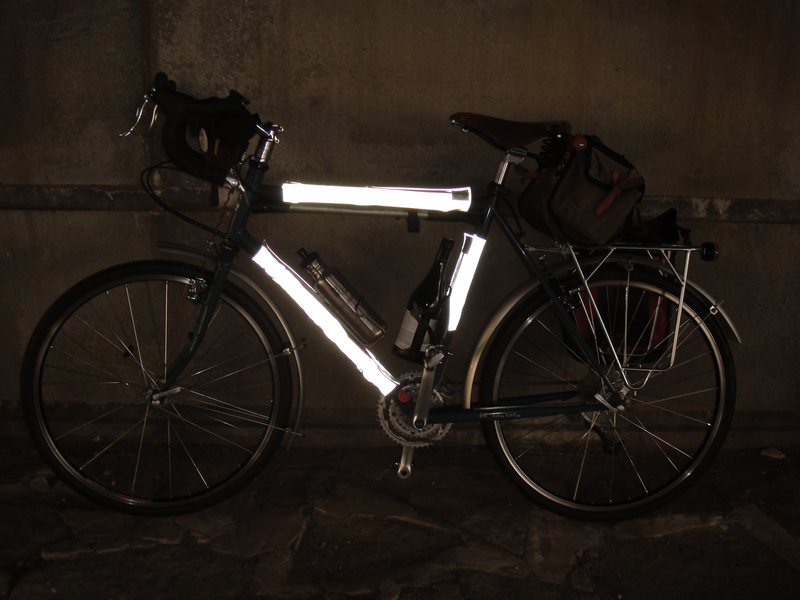 Time to think about nighttime riding and making yourself even more visible to traffic. While a head- and tail-light are critical for rides after dark, there are other accessories worth considering for your bike, too. A couple of months ago, the people at BikeWrappers asked me if I’d be interested in reviewing their product. I agreed, and they sent me a set to test out. 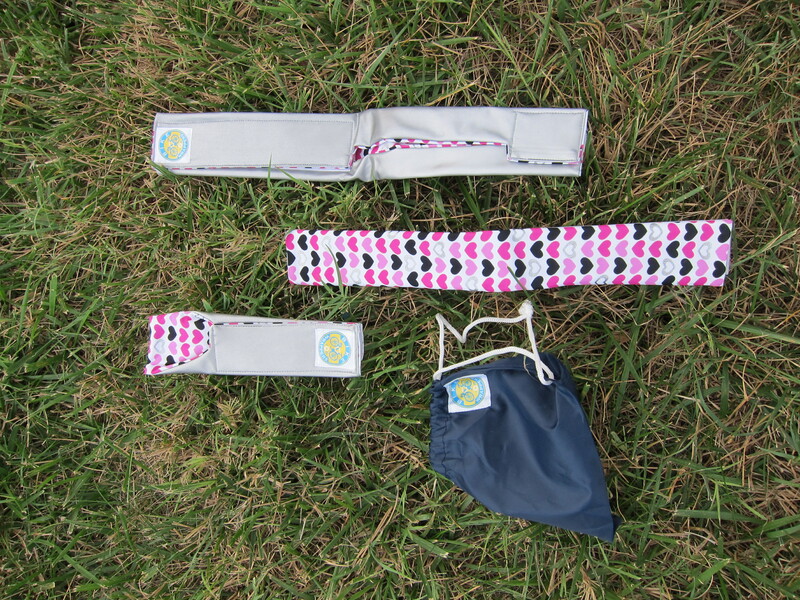 BikeWrappers are three fabric panels that affix via Velcro to three different sections of your bike: the top tube, seat tube, and the down tube. BikeWrappers are two-sided. One side of the BikeWrappers is for decorative purposes and has a pattern or is mono-color. The other side is made purely of reflective material. Given that I sometimes use a top tube protector on my bike and I do a lot of riding at night (and ride with a lot of other people who ride at night, I thought BikeWrappers could be a useful product, and I took it for a few rides to test out. 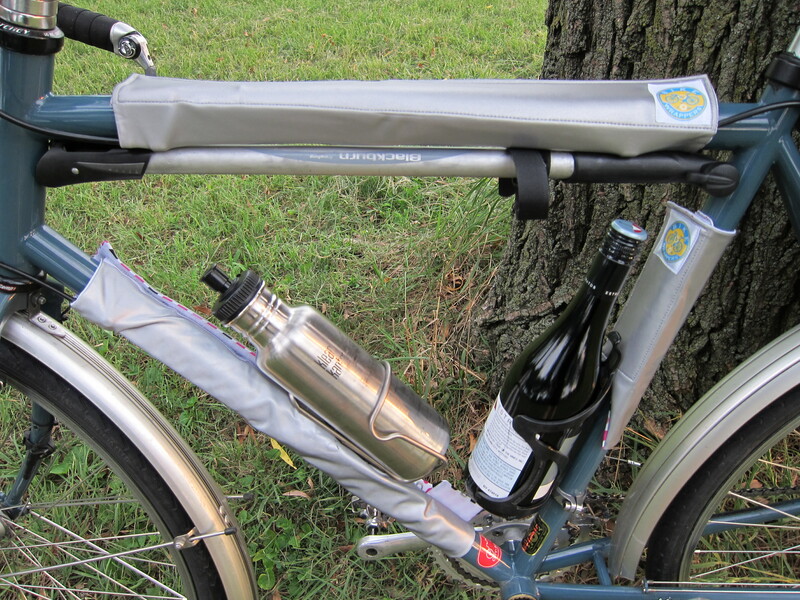 I evaluated the BikeWrappers based on the following criteria: aesthetics and functionality. I then broke down functionality into their nocturnal visibility and the ease with which the panels can be affixed to the bike. I found the reflective side of the BikeWrappers to be pleasing to the eye. I like the little logo they use, and the gray hue did not detract from my bike frame. The non-reflective, or patterned sides, of the BikeWrappers did not really suit my personal aesthetic. Of all the designs they had in stock, I chose the “Lady Hearts” pattern. I am a lady, and I like hearts. I also liked the color combination. When I was selecting the pattern, I tried to choose something I thought would look ok with a couple of my bikes. However, I did not anticipate using the BikeWrappers with the design-side facing out. I was primarily interested in using these for their reflective capabilities. I initially attached the BikeWrappers as instructed, to the down-, seat-, and top-tube. It seemed to overwhelm my bike and reminded me of those people that dress their dogs in sweaters. I really don’t want to be one of those people. At the same time, to maximize the reflectivity of the BikeWrappers, it makes the most sense to use all three panels. Personally, though, I liked using the BikeWrappers for my top tube. I think this company should consider selling these as a set of three for those who want the full shebang, and offer a separate top tube protector only option as well. As an urban cyclist, these come in handy for protecting my bike when locking it up to racks, poles, or other metal things riders end up locking their bikes to. Visibility: The BikeWrappers have an excellent functional aspect, which is to make you more visible when riding your bike at night. In this regard, the BikeWrappers succeed. According to BikeWrappers’ site, these are visible to cars from a quarter mile away. I took a few shots of these using flash and, while I cannot speak to the exact distance at which these become visible to cars, they do light up well, making them good for being seen from the side. Obviously to be visible by cars coming at you from the opposite lane or directly behind you, front and rear lights are still essential. Attachment System: Velcro runs the full length of each panel, and each panel attached easily to my bike. The panels for the down tube and the seat tube are made to accommodate water bottle cages, and I found they did not impede my use of either cage. I also tested whether the top tube section would fit on one of my mixte tube, and it easily did. BikeWrappers are made for diamond-shaped frames, though, so the other two panels would not really work on it. An additional note about rain: Systems like this have their limitations (to me) when riding through a steady rain. The fabric gets wet, and that wetness clings to your bike. If I was using a top tube protector or the BikeWrappers and it started raining, I would stop to remove them so as to limit riding around with wet fabric on my bike. The BikeWrappers do come with a little carrying bag, though, so it would be no issue to stuff them into that bag and then throw them in my Carradice or pannier. Overall, BikeWrappers are an easy-to-affix system that offers additional visibility to cars, particularly peripherally. Made in the USA (San Francisco, California, to be exact), they retail for $45 a set. Practically, I cannot see myself using all three of the wrappers at the same time, but I really really like using the top tube wrapper. 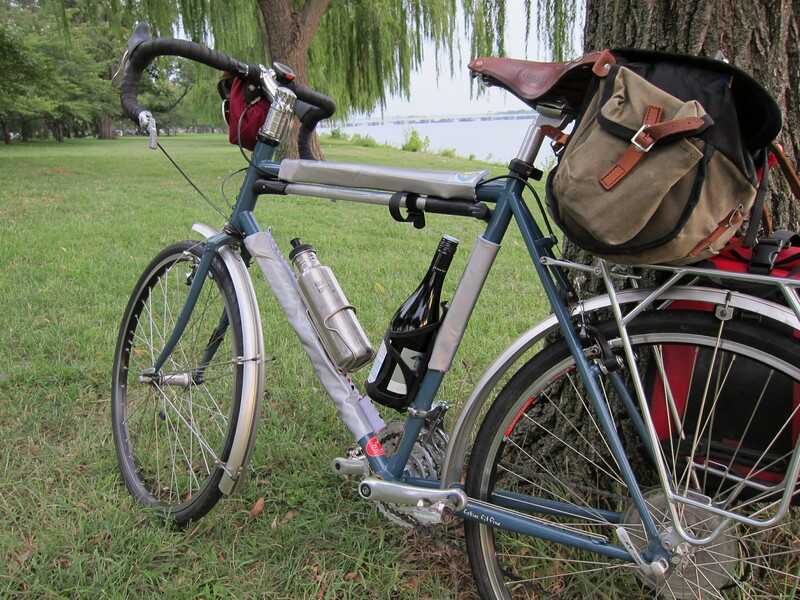 Perhaps I would use all three on a brevet or some other type of ride that required a lot of night riding. 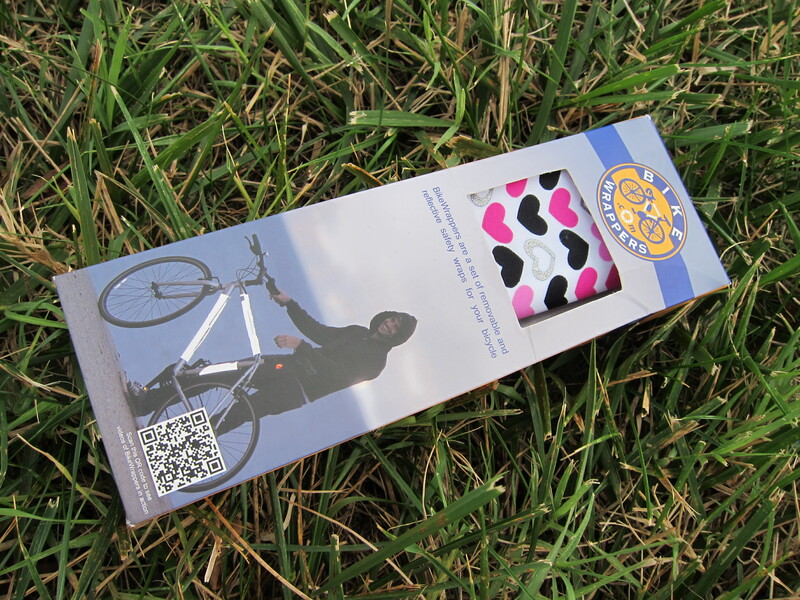 BikeWrappers are also machine washable (although I did not wash the set provided to me), and the company offers a money-back guarantee if you are not satisfied with your purchase. I’m glad that companies like BikeWrappers are thinking of creative ways to make cyclists more visible. Although I’d like to keep them, I don’t want to be greedy and I’ll be giving away my set of BikeWrappers in a random drawing. Comment below by October 21, 2012, for a chance to be the new owner of these BikeWrappers. If your comment could also include a song recommendation to add to my workout playlist, I’d appreciate that too, as I’m trying to get some new music into the rotation. Winner to be chosen at random. Thanks to BikeWrappers for the opportunity to use and review this product. 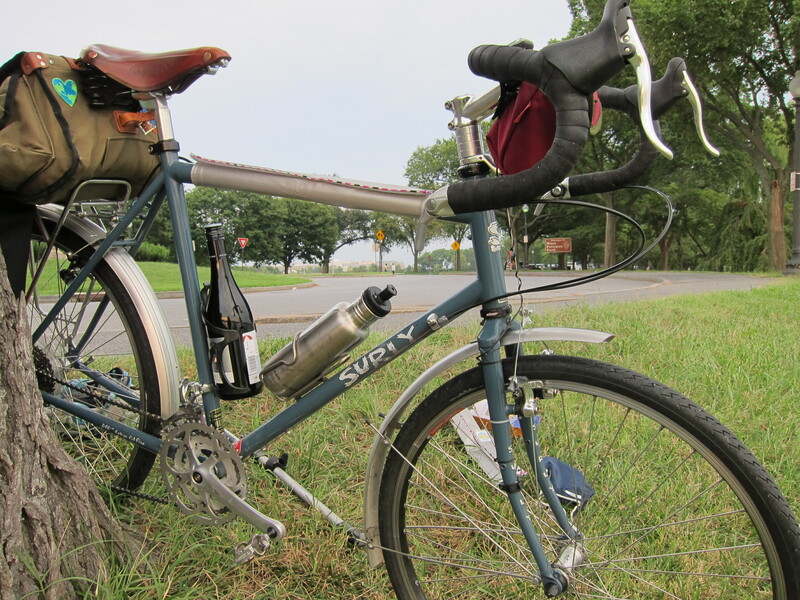 We’re back tomorrow with more coffeeneuring! Great giveaway. I like Bombs Over Baghdad as the first song on my workout mix. Gets my blood pumping! These look great! 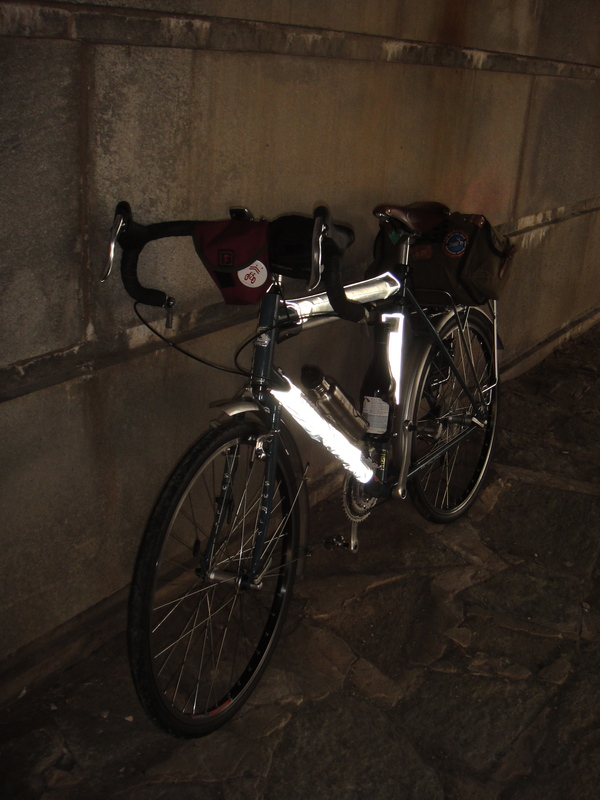 Now that it’s quite a bit darker on my am commute, it’s time to break out the lights again. I like The Big Damn Band “Can’t Pay The Bill” in my workout mix-great rhythm! Great post, nice lady. You do something in your blog post that I often suggest that people do… Test your visibility. Lots of us think we’re visible to cars, but are we really? Taking flash photos of you and your bike can help insure that we can be seen. I have not seen any issues; just affix the BikeWrappers over the cable. Those do look cool! Anything to be visible is good in my book! In any case, not sure what kind of music you are into, but I find anything by Smashing Pumpkins to be great for a workout. “Zero” is particularly good for climbing a hill! Ugh, getting doored. Hope you’re ok. I’ve only been doored once (knock on wood) and that was enough for me. Yep, it was no fun! Once was enough! No brevets for now, as my hand still hurts when I ride for much more than a few miles, but able to bike commute at least. Thanks for the kind words! Oh, and ditto on the knock on wood! I love reflective stuff. These look cool and would come in very handy as I will be doing a lot of night biking in Oct-Nov as I have a night French class. Happy working out to music! An interesting idea for a better lit bike.